In a post a few weeks ago I looked the impact of playing time for Swansea on injuries and the domino effect injuries had (players get injured means remaining players have to play more, often getting injured themselves and so on until we ended up running out of midfielders in January). 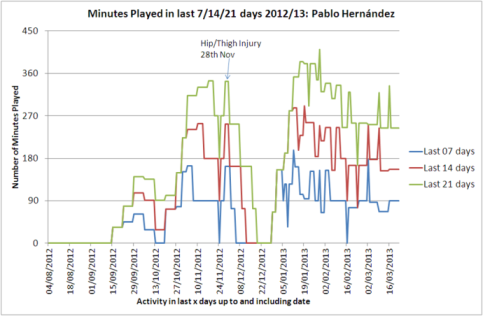 One of the areas looked at was the playing time of Pablo Hernandez who has (unfairly in my opinion) gained a reputation as being fragile due to repeated injuries this season. As Pablo got injured again in the last game against Crystal Palace I was planning to update his data but similar injuries in the Champions League to Ozil and Aguero along with talk of 'dinosaurs' and 'incompetence' from Raymond Verheijen made me want to extend this. Garry Monk said Pablo felt his hamstring pretty much from the start of the match against Crystal Palace, Ozil injured his in the 2nd minute against Bayern, Aguero in the 3rd minute against Barcelona. 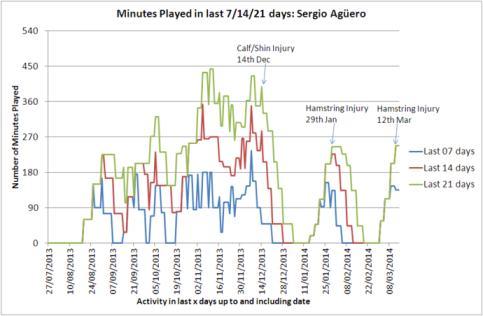 The other thing that links all 3 is that they had all played 90 minutes around 72 hours previously to getting injured and have all recently come back from injuries (prior hamstring injuries in Pablo's and Aguero's cases). Obviously players get injured on a regular basis and hamstring injuries are not rare but for all three to suffer strains right from the start of the match suggests possible issues around overplaying and insufficient recovery time, either from previous injuries or previous matches. For Pablo, the three times this season the playing minutes have ramped up, he's ended up with an injury, this is far from proof of over playing but does at least flag it up as a concern. The stop-start nature of his season has meant that Pablo's been given this injury prone tag but there's a reasonable chance that it's playing time rather than 'bad luck' causing them. Looking at Pablo's minutes for last season, joining from Valencia after the season had already begun, he was pretty much an ever-present apart from a gap of a few weeks in the middle of the season. For Ozil, much has been made of loss of form, a perceived lack of effort from some areas of the press who are often using the transfer fee as a stick to beat him with. 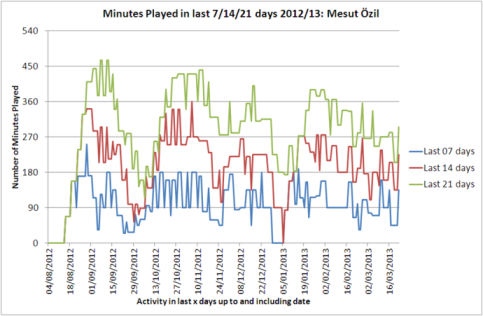 Ozil's minutes: from Sep to mid Nov, Ozil played 2 full games in any 7 day period on a fairly consistent basis (includes International matches) with a period around mid Dec where played equivalent of 6 full games in a 21 day period as usually plays full 90 when started. For Aguero, his record this season when he has been playing has been superb (28 goals in all competitions, average a goal every 75 minutes played) so it's easy to see his importance to the team. 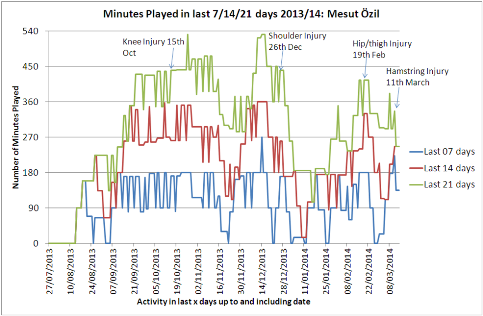 Aguero's minutes, before his injury in mid-Dec, Aguero was playing regularly but not at the same volume as Ozil. The Tue/Wed split of the champions league means sometime a player can have 3 games in a 7 day period e.g., Wed/Sat/Tue which is potentially a key issue to overplaying. 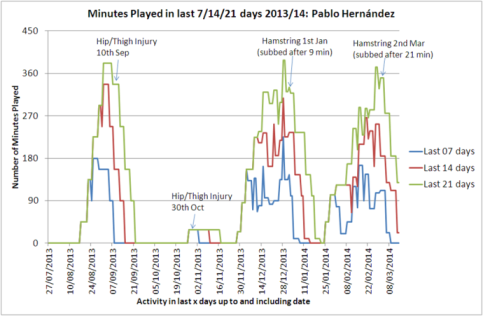 For the two hamstring injuries in Jan/Mar, how much are these caused by minutes played after recovery from a prior injury? There's always the risk when looking at things after the fact of trying to apply a pattern to something where no pattern exists, there will be other players with similar playing profiles who've not been injured and minutes alone is only a basic measure and doesn't take into account intensity of match, travel etc., A player may have 0 game minutes but even being part of a match day squad for a trip to Europe is likely to impact on 2-3 days of their training. Unfortunately there's not going to be a 'one size fits all' approach to prediction and prevention of injuries and there'll always be the temptation that any given match is big enough for it to be 'worth the risk'. If you're a manager facing an important match and 'knew' a player had a 30% chance of getting injured early (as an example) it's likely you'd take the gamble anyway, it may not be the optimum decision over a long period but seeing as a club can go from being comfortable to being 'in crisis' within the space of a week, long term planning may not extend beyond the next 4 games if you're lucky.